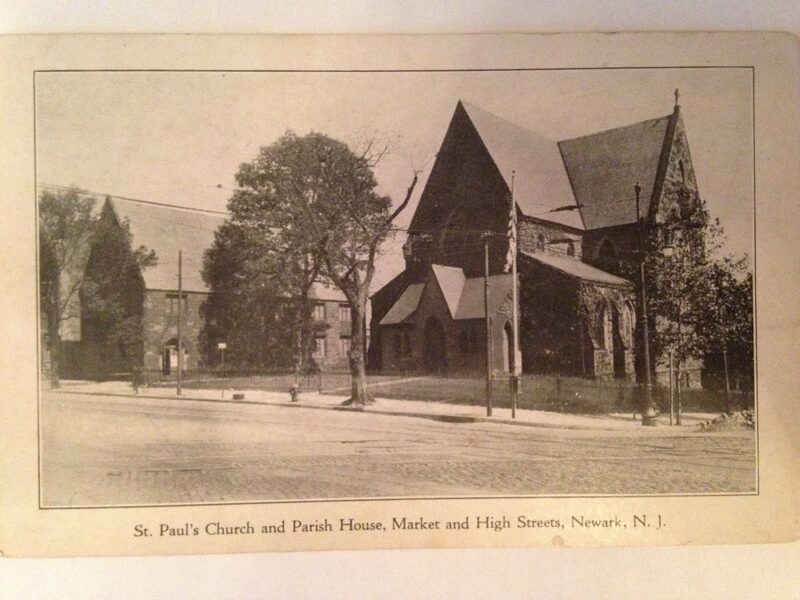 St. Paul’s Episcopal Church was located on the north east corner of Market and High Streets. The parish was organized in 1853 as a mission, under the Rev. Andrew Mackle. The church owed its commanding location so near the city’s center to Mr. Jeremiah Garthwaite, a founding member of the new congregation. Recognizing the value of such a location for the church Mr. Garthwaite traded property he owned on High and Bank Streets (an intersection that no longer exists , Bank Street having been absorbed into the Essex County College campus), to acquire the site for the church. The church considered it a source of pride and honor to be a down town church. The first service was held in a pre-existing structure on the property , a large brownstone farmhouse, in the early part of 1853. It was also at this first service, that Mrs. Garthwaite placed the deed for the land in the offertory plate. The deed stipulated that the pews should forever be free, and that no loan should be negotiated with the church property as security. Soon after the Rev. Hannibal Goodwin became rector in 1854 plans were developed for building a church alongside the former farmhouse, which was now a chapel, rectory and parish hall. The Rev. Goodwin, who left St. Paul’s in 1859, later made a name for himself as the inventor of flexible celluloid photographic film. At that time he was rector at the House of Prayer Episcopal Church on the corner of Broad and State Streets. The rectory, where he developed his invention, is the Plume House, the second oldest extant house in Newark. Nothing came of those plans to build a church until 1873 when in September, the Right Rev. William H. Odenheimer, Bishop of New Jersey, laid the cornerstone. The Rev. Joseph H. Smith was then rector. Work on the building came to a halt when the walls had risen only a few feet, because of the difficulty collecting funds, which was due to the financial crash of 1873. The Rev. William J. Roberts finally became rector and took up the task of completing the Gothic style structure. The majority of the structure was of brownstone and had the decorative details common to that style. The façade was very simple and made of brick. The reason for this was that the front portion of the church was never finished as planned. What had been a temporary fix to complete the church and get it opened became permanent. As built the building could hold 1,200 members.The first service was held in the church on June 24, 1889. 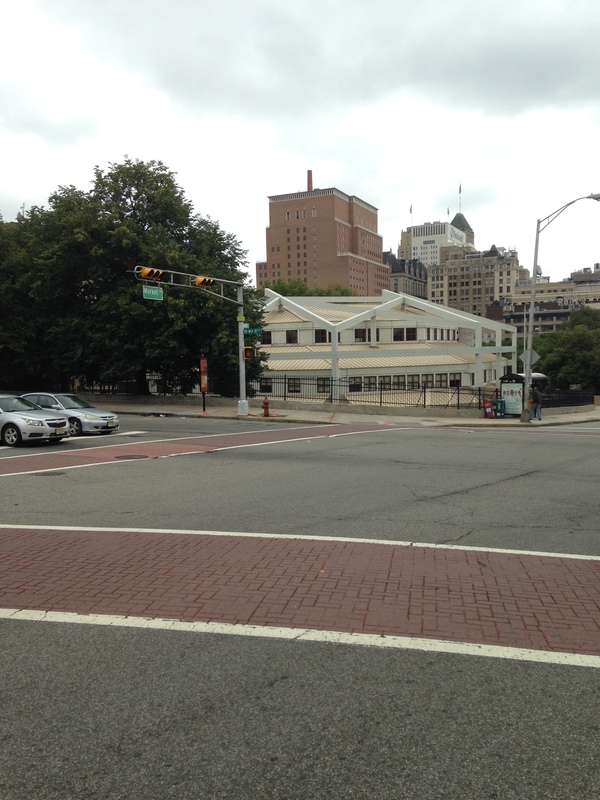 The site of St. Paul’s and its parish house is now occupied by the student center for Essex County College.